I did a guest lecture for final year media students at Sherubtse College. I introduced to them one of my pioneering work in academia – the middle path journalism – a theoretical framework for the Bhutanese media. The book chapter by the same title is already used in some foreign universities as a required reading. I am glad it will also be included here from next semester. Besides the academics, the students asked me for some advices as they complete their college life in two months time. Here is what I shared with them. As a media student you will be expected to communicate well. If you don’t, you will be doubly handicapped – as a graduate and as a media graduate. Even otherwise, in any career or in life communicating well is a prerequisite to a successful life, career and relationships. Not communicating and not knowing are the same. Make sure you are able communicate so that you can share your knowledge and take our country and humanity forward. Make the most of your time left out here to start preparing for whatever you will be pursuing as a career. If you heading for the civil service, revise your maths skills because that’s where media students suffer in the BCSE test. In other sections of the exam, you should be okay. If you are going for career in media, start collecting your portfolios of photograph you took, video you made and articles you have written. This will come handy when you apply for jobs. Be ahead of your competitors in life. Don’t lazy around. 3. Take life as it comes. Most importantly, as you move into the next phase of your life, always remember that many good thing will happen – but so will bad things. The key thing to remind yourself is not to be too sensitive or be to reactive to either and to let go both eventually. Don’t take life too seriously. Enjoy your life, have fun, cherish each moment and people you meet and above all, be open-minded on everything. Do not discriminate between jobs, or people or experiences. Take everything with an open mind. People say that things happen, and people come in your life, for a reason. I would say you find reasons and make the best of everything. Have a long-term vision, but do what is immediately placed in front of you. Grab anything that comes your way, do as many things as possible, go see places, meet as many people. Lastly, whatever happens, especially if you are going through hell, keep going. I grew up looking after cows. The job entailed herding the cattle into the jungles and leaving them there to graze – while I dipped my head in books or catch crabs in the stream. As the day passed and the Sun dropped towards the horizon, it was time to regroup the cattle and head them back home. Some cows, however, would have strayed off the herd and my job was to find them in the thick forest, where quite often I would lose my way. “If you are lost, you should go back and find your own footprints,” my grandfather would advise me. I followed him and never got lost – even once. For over 40 years, I followed the same advice when it came to my life too. Quite often I got lost in the medley of wrong choices and decisions – and found myself in the thickets of confusions and lack of confidence to move on. So I often turned back and found my footprints – from the place and the path I followed. Hence, it is nice to be back to where it all started for me. This is the spot, where 51 years ago, among these splendid mountains of memay Ralang, Tshong Tshongma and Serkemla, with the Vajra Dakinis (Dorji Khandum) presenting at my birth, I saw the light of the world. The auspicious nativity was however countered with the sad economic conditions at home. My family was poor, and had nothing. We lived in a one-room hut that had to be repaired with each passing storm. For much of my childhood, the piece of cloth I wore was the only one I had. I had no slippers or shoes. We scrambled for food and there was not much to be found. So my sisters and I would wait for our grandfather, who was a lay lama and was served with some meat and rice for conducting rituals and religious ceremonies in the nearby villages of Radhi and Chaling. He rarely ate his lunch and instead packed them for us at home. All along my father was away, drafted into the army, following the brief war between our neighboring countries in 1962. Nonetheless, the extreme poverty didn’t deter us from being happy. My mother had an endless supply of jokes and songs and stories. Some, she made them up. She was extremely talented. She taught us never to blame our misfortune on someone and instead smile against any adversity – and never to lose our sense of humor. My grandfather assured us that everything was temporary and that we would one day be back to our former glory. He used to tell me how our great grandfather used to launch long pilgrimage expeditions to Tsari Rongkor in Tibet – with 30-40 horses and several servants and porters. My mother and my grandfather also kept reminding us that we are descendants of “givers from top and not receivers of alms from bottom (a Bhutanese aphorism to mean noble families who are not only wealthy but generous too) – and never to forget this fact even later in life. I was also told that one of our ancestors came from Aja and was a great yogi while our great-grandma who was still alive and living with us was an ashi from Tawang. Today I stood here in silence for few minutes and paid tribute to my two greatest persons whose lives, characters, and optimism shaped me and my life – and the lives and the characters of all my siblings. From this ground, where three prayer flags stand today, like the wind, I fluttered away – launching my own expeditions into my own dreams and journeys. As years rolled by, I rose to positions of power and prominence. I did things that I wanted to do and achieve what I wanted to achieve. I travelled the world – and continue to do so. 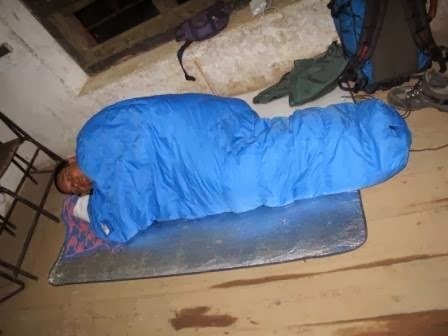 I have not only managed to come out of those miserable conditions but have personally helped hundreds of families to do so in distant places like Athang gewog. And of course I have tasted glory and fortune too. Yes, I have come very far. My grandpa was right. The condition we were in when we lived here was temporary. So, in life if you are doing well, push harder. But if you are getting nowhere, just turn around. Retrace your footprints. Trace your roots. And launch yourself again. You will appreciate from where, and how far, you have come; what kind of hurdles you have crossed and how many things you have achieved in your journey called life. It will give you the confidence to move on. For, you and only you can find your path and walk your dreams. I spent a wonderful morning in Jakar High School today, where I was invited to give a talk to the students and teachers there. In little over 45 minutes I was given to speak to 600+ audience, I shared my own story of how early on in my life I found my purpose (to be of service to others) and passion (media and movies) – and how everyone should find one’s life purpose to give a meaning to one’s life. Purpose gives us a sense of direction, our principle and an ideology. Passion drives us, motivates us and gets us out of our bed. Without the two you will be wandering aimlessly. Without a greater purpose, we end up seeking happiness in the external and the material – and wait for salary raise with every new government – or get devastated, or fearful, by few audit memos. One should be fully in the present moment to savour what life has to offer. That’s called mindfulness. And avoid the typical Bhutanese style of delayed enlightenment (where you enjoy moments retrospectively) or of hedonism (as if there is no tomorrow) or of nihilism (where you feel you are no one). As milay Rimpoche, we all have a purpose – otherwise Good must be stupid to throw us on Earth without one. Find your purpose and live your life meaningfully – and in the service to others – your family, friends, community and King. The present generation, if I may characterize, seems less resilient when actually it has to be stronger than the previous generation. This is not good. If there are two things that one needs to cultivate to develop internal strength, they are empathy and attitude. Empathy is the ability for one to share and understand the feelings of others. This, unfortunately, seems to be lacking nowadays – especially among our public servants. Who has not walked or travelled for days to get some public service, only to be turned away at the counter by an unempathetic official. Perspective, on the other hand, determines our relations with the social world. It guides you to make sense of whatever happens to you as you dwell in this samsara. Perspective is the space between what fate offers and how you react. As the great German psychologist, Victor Frankl, said, “between a stimulus and a response, there is a space. In that space we have the power to choose.” Unless you cultivate the right perspectives you will always make wrong choices. So, what do you choose to be. I ended my talk with my favorite line: in pursuing your passion and dreams, you will garner success. Don’t be overwhelmed by it. You will also face lots of disappointments. Fear not; for, disappointments will reveal who your true friends and family are. Cry if you must, but collect the broken pieces, smile, and learn to move on. And whether you taste success or failures just say to yourself – life goes on. And life will most probably smile back at you. Last week I visited the Norbuling Rigter College in Paro – accompanying a group of American businessmen who were touring Bhutan as a part of the Abroad Inc – a US-based executive education company. While they interacted with the students, I also shared few observations plaguing our business sector. Here is an excerpt from the interactions. 1. Reinvent the Wheel – Many people ask me to suggest new business ideas while others seek my opinions on theirs. My take on this is that there is no need to absolutely invent a new product or service. In fact it is not even a good idea to start something new in Bhutan. We are not a nation of early adopters. So you can pick an old one and work on it and make it better. That’s called innovation. You can reinvent the wheel. For example, how can you improve the taxi service in Bhutan? Can you take over the water supply system in Thimphu from City Corporation? Can you do better ezays and pizzas? And so on and so forth. Look at existing businesses and see if you can do better. Actually you can, because currently our services and business outlets are really bad. Momo has not evolved since 1970s. You, as younger mind and better educated, can do better. 2. Commitment – I do lots of carpentry as hobby and for the last twenty years I have been visiting saw mills to buy sawn timbers. They would tell me to return after few hours. I drop the list of my requirements but I have no memory of any saw mill delivering anything on time. Likewise, recently it took me five reminder visits to a tailor to get two ghos stiched. Be it in the government offices or a business house, keeping commitment is a major difficulty in Bhutan. Can you keep your commitments? Can you be trusted? Can you keep your words? Can you deliver on your promises at all cost or whatever happens? If you can’t commit, nothing will work for you in your life – lesser still in business. 3. Value-added services. One dream of every Bhutanese is to earn without working. So being a middleman, receiving commissions or fronting businesses without lifting a finger are very popular. The other month I was driving up from Gedu and I came across many trucks with semi-finished wood products or potatoes going to India. I know there across the border, they work on the value-adding the products and sell them back to us at triple the price. We idiotically buy our own products that we could have done ourselves in the first place. Can you be less lazy and do the value addition here? Can you create jobs? Having great idea is not enough but you should honour your commitments, innovate continously and stay ahead in your game. Then may be you can achieve some success in your businesses. “Finally let me get to something that I want to share from the core of my heart – while speaking my mind as usual. I am sure your parents, your teachers and the speakers before me must have told you that you are special. So, let me be the black sheep, and tell you some hard stuff. Maybe for your mother, you are special. To the rest of the world, you are not. The world doesn’t give a damn of your existence. You are just one of the 7 billion creatures on earth – called humans. When you leave this school, no college is going to roll out a red carpet for you. For those heading for the job market, the reception will even be worse. When I was in school, I was told that I was special. Every VIP told us that we were special. But after I graduated from there, I felt like a stray dog. I spent one full week wandering around in Thimphu – in a deep winter, to get a slot for further studies. The same chief guest who told that we were special didn’t want to even see me. You are not special. But….. You. Can. Be. One. You are not special. But….. You. Can. Be. One. You can be special. However, you must earn that special place. You can only be – by doing something good to others – and by being in service of the community, King and country. Doing good should be a habit. It is like respect. You must earn it. You must work hard. You must practice. You must start from today. Right now. Sorry, not right now. Right now, please listen to my speech. You can start by being a special person to your classmate, to your roommate. You can be a special person to this school. Then when you grow up, you will be special person to your community and the humanity – at large. Remember, the world doesn’t owe anything to you or me. We owe it to the world. This country doesn’t owe anything to you or me. We owe it to this country. For me, every moment of my day or my life, I try to be of service to others. It has now become my second nature. I try to be nice – even nice to total strangers. Last week, I was hiking up to Taktsang. When I reached the waterfall below Khandro Yeshey Tshogyel’s caves, I overtook an old and fat Indian lady. I am saying “old and fat”, not to demean her but to make a point that she was unable to proceed any further – because of her weight and age. She was breathless. Taktshang stands at over 10,000 feet and one can suffer altitude sickness – especially among people coming from lower altitude. I thought she was sick so I ran some medical questions with her. “Are you OK? Are your feeling nausea?” “Headache?” “Do you have stomach cramp?” These are the symptoms of altitude sickness. She had none. So, I joked to her that “you Indians, you eat too much rasmalai.” She smiled. I continued in perfect Hindi, “Actually, I like rasmalai and I am sure I eat more than you” She smiled again. “Come on, you have walked up till here and you are giving up?” “We will do it together. Hold my stick. I will pull you up like a gaur”. I let her hold one end of my walking stick and I started pulling her uphill. She was heavy. There are at least 200 steps to get to the top. A near vertical climb. We made a few steps each time and stopped to catch our breath. I taught her breathing exercise. I encouraged her. I raised her spirit by telling her that if she wanted, I can also call a flying tiger. I told her that I had Guru’s number. After a vigorous 30 minutes (usually I take less than 10) we made it to the top. When we finally did the last step, there was a loud cheer from other tourists and visitors who were watching the whole drama. She looked at me and said, “Thank you. Thank you. You are my God today”. I felt nice. I felt special. I even thought that if had become a God, I should try flying off from Taktshang. I changed my mind and decided walking was still better for now. To end my speech, as I said, to your mother, you are special. Furthermore, I must add two more persons for whom you are special. First, is your Principal here – madam Deki – an extraordinary educationist – a good human being. To her each one of you are special. She feels for you like a mother. And then as Bhutanese, each one of us, we are special in the eyes of our King. You can trust me on this. Since the people for whom you are special are so rare, then what I want you to do is that as you grow up, I want you to never fail them – EVER! I want you to make them proud. Because to them, no matter what, you will always be special. For the rest of the humanity, you will have to earn your rights. Remember your parents don’t owe anything to you. Our King doesn’t owe anything to us. Your principal doesn’t owe anything to you. Start today, keep doing and keep going. I see many of my friends on the social media sharing newsfeeds from questionable sources on benefits of this or that plant, miracle foods, health supplements, weight-reducing stuff, fat-burning creams, etc. I would them to be very careful with these things. Some may be genuine but most are either fake or commercial stunts. One basic thing to remember when it comes to healthy living is that our human body is extremely complex and what worked in some countries or people, may or may not work in your body. In some case, it could be dangerous too. For example, quinoa gave me diarrhea when I once ate it. I guess my body didn’t recognize this magic food. Or I suppose, I don’t have the enzymes to break the quinoa into energy. Then there are scientific claims that they have been experimented on rats or guinea pigs. We are neither rats nor guinea pigs. My simple approach to food is, whatever we (me and my ancestors) ate in the last 5,000 years is good. Something from a distant land could be tricky. Human body is also very strong and resilient and can absorb quite a large dose of toxins, which we consume without knowing – like from pesticides, food colorant, packaging, etc. So, go slow on all these ads and websites about detox-week, detox foods, etc. I am not a medical doctor but I suppose that if there are toxins in your bloodstream, you die. If there isn’t, there is no such thing as detox either – unless of course you are a drug addict or an alcoholic. There is a nice article in the Guardian on this. Like wise there is no such thing as lose weight. You burn fats and that has been achieved in our country through active lifestyles in the farms and not by drinking a magic portion. Now with urbanisation only way is to leave your car and walk up the mountain every morning and eat healthy. By the way, for those living in Thimphu and the major towns, you can visit the nutrition specialists for advice. You need not be ill to go there. Get professionals to suggest what is good and what is bad. Not the Google and not the TV. Make use of our free medical services. The nutritionist will get your medical history, check your BMI, and prescribe you what is good and what is not good for you. I did that few years back. And don’t forget, we also have the Traditional Medicines in our free public health system. Visit them if you really want to know which plant to eat to lower your blood pressure, or to keep your diabetes and heart diseases on check. Above all, have more confidence in your own body. It is gift. Well, let me start by saying how humbled I am to be asked to speak to you. I am neither a VIP nor a celebrity and so I must apologize to you for ruining your Sunday. I suppose, now, I must also do some justice after getting this honour. I had a topic in mind, which I always share with school students wherever I go. It is about finding your passion and purpose in life. But after getting here and looking around, I see myself in you – a poverty-stricken boy that I was – of some 30-40 years ago. So, let me share my own childhood story that somewhat resonates with yours. Hopefully, it will inspire you to make a better world for yourself and for those around you. Unlike what I am today, I grew up in a very poor family. We lived in a hut and our only priced property was a goat. As a child, I remember complaining about being hungry all the time. And so, when I turned 7, I was packed off to a boarding school in Phuntsholing Kharbandi, where the government provided everything from food to clothing to basic needs. There our life was hard. We slept on bug-ridden beds and ate worm-infested food. We woke up at 5 in the morning to study, pray, clean our campus, have breakfast and go to class. The academic part ended by mid-day and after lunch, we had to go to our respective workshops where we learnt tailoring, carpentry, sheet metalling, welding and so on. For much of my school life, I also went barefoot – with Bata slippers at the most – or a pair of converse shoes that the school provided, which lasted for few months. We were all poor and so we didn’t mind being that way. Now, when I look back I cherish growing up poor. I thank my parents for the poverty. It hardened me like a steel. It taught me valuable life-lessons – to be empathetic and to identify with the down-trodden. It taught me to be a good human being. I completed my school in 1982 and I was sent to work in a factory in Gedu. Two or three months into my first job, I realised that, although I was paid well, it was not what I wanted to do for the rest of my life and so I ran away to Thimphu to try for further studies. After waiting patiently at the door of the Department of Manpower (which had just been renamed as RCSC), for a week in freezing winter, I got admission to Dewathang Polytechnic to study electrical engineering. From there I went on to do advanced studies in electronics engineering in Italy in 1988. The generous scholarship to Italy also improved my economic situation. I could not only take care of myself but I also helped my parents bring up my two other siblings and three younger cousins – and build a house in Thimphu. I returned from Italy in 1995 and I had a comfortable job as an engineer in BBS. For many a government job is the dream and destination. For me it was a platform to do more – do new things – to leave a legacy. I proposed introducing FM radio – which has better signal quality. You guys are too young to remember how badly BBS Radio sounded in those days. But FM was a hard sell because some foreign consultants had concluded that FM radio was unsuitable for Bhutan. I knew that it was not true and I challenged that finding. After successfully testing the FM technology, we introduced in the whole country starting from 1998. After FM, came the TV project, which faced another big challenge, as His Majesty the Fourth King had earlier shown some reservations on introducing television in the country. We all know that the King’s words are sacred, but I always believed that circumstances change and the prevailing context was that we required to bring in TV and Internet, which we ultimately did in 1999. In those years, I worked 16-18 hours a day on average. I worked with the laborers at site. I led the technicians to do installations on high towers. I pitched tents and lived at the construction sites. I resigned from the government in 2006 after my career hit a wall. Just two weeks after I won a big international award for one of my documentaries, I was barred from making them. Instead of sinking into despair and lament, or fight a losing battle, I decided it was time to move on – and away. So, I pursued an independent life of filmmaking and journalism. However, in 2009 I was called back into the government again, in the service of His Majesty the King. I was there for four years – until 2013. That was the zenith of my career – an honour and a dream of every Bhutanese. My whole family, friends and I are still very proud that I have been through that. After I was relieved from the palace, I offered myself to teach in Sherubtse College as a temporary teacher – gloriously known as adjunct professor in university parlance. There I discovered yet another world, in teaching and research. I know you all dream of being successful in your life. If you define success in terms of being able to do things that you want and thrive too, then I must say I had a successful life. Today as I reflect on my life, there are three things I can draw from there – which I define as my style and approach. For, success and happiness start with one’s approach and attitude. People talk about nepotism and corruption. I had neither a powerful uncle nor did I indulge in corruptive practices. If I have been successful regardless, so can you. Here are few things that may come handy. In my career I have recruited, groomed, mentored and taught hundreds of Bhutanese. One shortcoming that we all seem to have, irrespective of our profession, is that we don’t learn the fundamentals – the basics. We let shortcuts and ego take over our learning. When I watch BBS today, I find that some shots are not even framed well. If you look into our private sector, we see lots of businesses failing because owners can’t keep proper accounts or read balance sheets – and salespersons lack basic courtesies. Whether you are, or you want to be, an engineer, a teacher, an architect, a footballer or a medical doctor, you must learn and master the fundamentals. If you don’t, you will find no success or meaning in any profession you choose. I have done many things in life. I was trained to be an engineer all my life. But when I moved to documentary filmmaking I picked up the fundamentals of camera works, scripting, editing and directing. Since I am now in teaching and research, I decided to go back to classroom to learn the basics of research and methodologies. In all the things I did, I can say that I have achieved some level of “success” – whatever this word means. As for you, at this stage, if you want to be an engineer in future, you need to be good in maths and physics. If you want to be a doctor or a vet, you need good foundations in biology. If you want to be a writer, you must perfect Dzongkha or English. In short, learning the fundamentals means learning the basics. If you don’t get your basics right, you will be an average – or below average. Being average… is the second thing I want to talk to you today. If you look around and observe what most people do, they do what is just expected of them. Many people don’t even do that. They are below the average. You are more than 300 here today and if your Principal has to pick some of you for some rewards, he wouldn’t know whom to choose. But let’s say, among you there are students, who do a little more. These students will be noticed. As life gets more competitive, you need to be noticed from a sea of average candidates. The same advice goes to teachers who have joined us here today. If you choose to be an average, if you don’t do anything more, if you don’t take initiatives, if you are just conforming to the norms and conventions, if you don’t take some risks, you won’t get very far. You will have to struggle for a job, for a promotion, for a scholarship or for recognitions. You need to stick your neck out. Now this also comes at a cost. Our society demands conformity and does not tolerate initiatives or criticisms. So, the choice is yours. As for me, I have chosen, and choose, to stick out. I know everything wasn’t always easy or rosy for me. The ride has been bumpy at times, to put it mildly. But if I could rewind my life, there is nothing I would do differently. Yes, always do a little more. Plant a tree, clean a classroom, water the garden, pick up a garbage without your teachers asking you. Form this habit at your age. I am sure many people must have showered you with all the promises of paradise. As a country, yes, there is no reason to be pessimistic. We live in a blessed land. However, as you live your life individually – like as you grow older, get a job, start a family and move forward in your profession, you will be faced with challenges and obstacles. Since your teachers and your elders have taught you how to succeed, let me tell you how to navigate your way out of disappointments, envies and enemies that will come your way – together with achievements, accolades and guardian angels. What I want you to always remember is to look forward and say to yourself, “OK! What next? Where next?”. We, Bhutanese, have the habit of nagging on something that has gone wrong. Move on! You know, in my life I have made mistakes too – a lots of mistakes – some were very big. But they only served to remind me that I am a human after all. The most important thing is to learn from them, never to make the same mistake twice and to move on. So do not kill yourself, if you fail in something. On the other hand, do not celebrate too much or put on added arrogance if success comes your way. Do not behave like you descended from heaven – like some of my own friends do. You will actually learn that success and achievements are not necessarily good. They attract envies and jealousies. You must also know that despairs and disappointments are not necessarily bad either. They reveal who your true friends are. Therefore, whatever happens in your life, promise me one thing – that you will always move on. Let me conclude by also reminding you not to forget to have fun. This is a golden age. As you study and prepare for your life, have as much fun, make memories and as many friends as possible. After this, you will have to get down to how best to serve our King and Country. Much of what I remember when I was your age was that I used to be my Principal’s worst nightmare because I was mischievous and fun-loving – always up to something. But unlike some youth of today, we never touched drugs or alcohol or attempted suicides. Please stay away from these things. You can have fun without indulging in drugs or drinks. They don’t bring any lasting joy. But they put an end to your parent’s happiness. So, to wrap up, again, three things – learn your fundamentals, stop being an average and whatever happens with your life, just keep going forward. I wish you all the best that our country, your life and the world, have to offer. On the hot seat. It is always challenging to inspire others. Some teachers came to receive me at Wangdigang with tea, momos and biscuits. Thank you again. That was so sweet of you all. With the 2018 polls way behind us, and with three elections on our back now, it is time that we reflect on how an important element of our democracy project – the electoral process, could be fine-tuned as we moved forward. It is my assumption that 10 years is long enough to take stock of what works – and what doesn’t, and shed-off few things while taking off new things. If democracy were a human, it would be in its teens – a formative period where serious reflections – and directions and definitions of one’s life, occur. I also assume that nothing – at least not the man-made laws, are cast in stone. Democracy and elections are a means towards our greater and long-term aspirations and interests as a nation. They are not ends in themselves. I must also add that what I propose here are neither new nor extraordinary. I am sure in many forums these topics were deliberated and hammered. My intent here is to spark off some fresh discussions in public domain – as debate and discourse are essential lubricants of the engine of democracy. While acknowledging the achievements – and the selfless works and sacrifices of many individuals and institutions, let me go straight to two issues that, in my view, warrant some thoughts, scrutiny and analysis. There maybe other issues too but in my opinion, these two need some attention. Currently, all the seats in the National Assembly (NA) are allocated through the first-past-the-post system whereby each candidate, including the party president, must contest and win his or her seat. This winner-takes-all system is not the only way. In fact, it has several undesirable outcomes that could theoretically happen. First, what if one party wins almost all the seats in the Assembly? A parliament without the Opposition Party may not give the political legitimacy of a parliament. Further, the situation could pose a grave threat to democracy as well as to all State institutions, as the Ruling Party has the votes to do anything. According to Article 35 of the Constitution, a simple majority is enough to move a motion for constitutional amendments – and three-fourth of the total seats to amend it. The Constitution is a sacred, but not an unamendable document, as some people like to believe. With the support of seven more members from the National Council, the Ruling Party could amend the Constitution or even challenge the Royal Prerogatives. While this scenario may seem remote or very unlikely, it is not a theoretical impossibility. Second, the first-past-the-post system has the drawback that a party president or key members of a party could also fail to win their seats. This happened in 2008 – where a party president lost his seat – and in 2018 where a key member of DNT couldn’t win. While so far it has not caused any major power vacuum, it is possible that we could get to a situation where the president of the winning party loses – and, also, has no capable leader to head the government or key ministries. Third, this system does not always reflect the popular choice – which is what democracy is all about. In 2008, the People’s Democratic Party won 33% of the popular vote but had only 4.4% of the seats in the National Assembly. On the other hand, this system could also result in a situation whereby a party wins the popular votes but not the majority in terms of seats – and thereby lose the chance to govern. In this case, we could have a government by the minority – which is another theoretical possibility. The other method of parliamentary seat allocation is through proportional representation. Given the above, our electoral laws need to be reviewed and consider a mix of first-past-the-post and proportional representation system. While retaining the existing 47 seats through majoritarian method, we can reserve few more seats in the National Assembly to reflect the proportional votes. Consequently, if, for example, a total of 6 seats are reserved, the party that wins two-third of the total votes could be allotted 4 additional seats, while the remaining 2 seats would go to the other party – that has won one-third of the total votes. So, even if a party wins all the 47 constituencies – plus has received two-third of the popular votes, it will get 47+4 seats. The two remaining seats from the proportional allocation will go to the other party. This way there will always be the Opposition represented in the Parliament. Besides, the overall popular votes are reflected in the Parliament. The mix system would also rescue the key party leaders by putting them in the House, even if they fail to win their seats. This way any potential power vacuum is averted. This system has been in place in many democracies – especially in the Scandinavian countries – which are constitutional monarchies like Bhutan. Obviously, it is not the best system and it has some share of issues. As a matter of fact, there is no such thing as ‘best’ electoral system. Hence, it is worth to think about it and carve one to suit our own needs and realities. Do we need party workers? If the post-2008 era has given rise to one significant challenge, it is the breakdown of communal harmony and personal relationships brought about by partisan politics. All over the country – and especially in Eastern Bhutan, villages and communities have been divided along party lines. The us-versus-them not only occurs during the election season, it spills over to the post-election period. In many places, like in my native village, the divide is never cured. In fact, they go on to taint the local elections and cast a dark cloud over the community and country – even after the election season has long past. While there may be other reasons, and players, in this Great Divide, one group that comes into prominence – especially during the election cycle, is the party workers. Some are affiliated with genuine motives to play a role in this sacred endeavour called democracy. But many are there to earn political favours – or to promote their own candidates by hook or by crook, which at times is scary. If party workers could stick to promoting their own party, it is one thing. However, it quite another story when they engage in mudslinging their opponents, carry out character assassinations, launch physical threats to people they don’t agree with and trade votes. And above all, even drag the sacred institution of monarchy into the murky game – which is totally unacceptable. These have happened in all the three elections. The question, therefore, is: do we really need the system of party-workers? Why can’t a NA candidate cover the constituency alone, when a National Council candidate cover the whole Dzongkhag? A constituency is a subset of a Dzongkhag, which is much smaller in size. Can the Election Commission hold more common forums, so that there is no need for party workers? Another ugly practice that I totally detest is the door-to-door campaigning. To me, this breeds hypocrisy where people “promise” their votes to all the parties or candidates – and where secrecy of ballot is compromised. Is it worth tearing ourselves apart? One of the most important element of national sovereignty for Bhutan is the national unity. Owing to its geo-strategic location and size (let’s not even talk about our ethnic, cultural and religious diversities), there should be no room for systems, or for individuals, that divide people and communities. We cannot prevent people from partisan mentality but we can fix the system. It is in our hands. It is absolutely necessary that we think and remain as one – even more so in the era of Fake News and the explosive social media that can destabilise our nation and our society. Ironically, we Bhutanese have short-memory – but only to go through the same hell – over and over again every five years. During the bitter election seasons, it is common to hear of political parties and candidates who are totally exasperated by the filth flying around. However, when it is over, the winner is happy to adorn to scarf and the sword and forget the bad times. In a way, it is good. But for long will our social fabric withstand without, one day, tearing everything apart. Hopefully, this set of parliamentarians will do something on the above in earnest. Language is not only a medium of communication – in that you don’t learn a language just to be able to communicate with someone. Language is a bearer of culture and cultural values, it is a conveyor of feelings and belief systems. And language provides the key to unlock the social world around us. Simply put, if you don’t speak the language or speak well, you cannot fully appreciate the intrinsic aspects of society. Your understanding remains shallow at best – and culturally alienated at worst. Above all, to draw from the famous Sapir-Whorf Hypothesis, language shapes our thoughts. And thoughts eventually dictate our actions. What this means is that the way a native English speaker thinks is different from someone who speaks Italian as mother tongue, who in turn will think differently than the ones who grow up with Dzongkha. In other words, the mind-sets of different native speakers differ – as per this theory. Therefore, it is quite worrisome that Bhutanese children – our children are deprived of a good grounding in Dzongkha because of the “shortage” of trained Dzongkha teachers in primary schools (Refer Kuensel article, December 25, 2018). This is perhaps the tragedy facing our national language – whereby an issue such this doesn’t raise any sense of alarm or uneasiness. I am a native Sharchopkha speaker and I learnt to speak Dzongkha in school. The role of schools in language education, therefore, cannot be overstated. In my current position as a communication scholar, one of the areas that I specialise in is sociolinguistics – a branch of communication that looks at how language does too, and shapes, a society. My concern, therefore, grows out of a deeper understanding of the role that a national language plays in the process of nation-building and the sense of nationhood. National identity compromised. Our goal of national unity and sovereignty will be severely compromised if the national language is accorded the second-language status – or if Bhutanese people do not speak well enough or take pride – to appreciate the richness of our culture, the importance of the social traditions or the taste for age-old folktales, stories and timeless wisdom. Both nation-building and sovereignty are a work in progress or a dynamic process – or both. So, what can we do? What are the possible solutions? The following are what comes to my mind. Other social thinkers and commentators may have more or are free to add or diverge from mine. Laws and policy. First, this is not an issue to be left to the Education Ministry or the Dzongkha Development Commission – although these agencies are at the forefront and can do more than what they are doing now. To start with, we need to move beyond the problems, mediocrities or blame-game and get down to some serious business. The issue warrants nothing less than a Parliamentary deliberation and perhaps an Act to protect and promote the national language – if there isn’t one already. The Act should, above all, require the Government to pour resources to this area – and not limit to mere tokenism such as requiring Dzongkha on vehicle number-plates or shop signboards. Rather, workable plans, programs and strategies to strengthen it should be formulated whereby we get to a point where Dzongkha is used widely with pride and pleasure. Only then we will be moving beyond the current state of affairs. Certification system. Second, the promotion of the national language could expand to a certification system whereby anyone with the required skills and knowledge could become a certified Dzongkha language teacher. Everyone knows about the TESOL and IELTS certifications. The Dzongkha Development Commission could develop basic, intermediate and advanced Dzongkha Language Teacher’s Certification (DLTC) courses, which could be delivered by public and private institutions. Anyone thereafter who is certified can teach Dzongkha in schools or anywhere in the world. Similarly, a basic DLTC certification could be a requirement for certain jobs requiring a public interface. Such a system could open an industry of its own, which will then go a long way into popularising the language. Private language centres will mushroom and some people might even venture into foreign soils to teach Dzongkha to the Bhutanese diaspora. English, which is one of the most difficult languages with complex syntax, grammar and even pronunciation has become the most popular language in the world – thanks mainly to such aggressive campaigns. It didn’t happen just like that – or out of the blues. New pedagogical approach. Third, systematic research needs to be done in earnest to further develop different pedagogical approaches to teaching Dzongkha. The existing rote-memorization-and-reprimand method may work within the monastic walls but not in a liberal education system. Besides, different native speakers have different ways to comprehend a new language and Dzongkha-teaching should factor these cognitive and linguistic realities. Promotion through popular art. Fourth, the two agencies that have contributed immensely to popularising Dzongkha (besides the school education system) are the Bhutanese film industry and the Bhutanese Broadcasting Service. Could we inject more resources and recognition to these two institutions? Could we take a leaf out of the Korean wave, where over US$ 200 million is injected annually into the K-pop industry by their government? Why don’t we push what works instead of lamenting what is not working? Lastly, Dzongkha should be seen as more than a subject. It should be viewed as an education in itself – by integrating and expanding to other skills and aspects of society such as art, music, history, culture, folktales and values education. Some of these are imparted as extra-curricular already, which is not enough. It is high time we develop further and move them into the mainstream. In conclusion, let me also point out that in the past any public discourse on the promotion of Dzongkha has been countered with the argument to do it at the expense of English – our current medium of instruction in schools. To me, these arguments are lame excuses or non-starters. The Dzongkha-English debate is not an either-or case. I know many friends and colleagues who are perfect in both. Some are perfect in three or even four languages (Dzongkha, English, Sharchopkha and Bumtap). Swiss people are, for example, fluent in all three official languages – German, French and Italian – and some even in English. Some of the best Dzongkha speakers of my generation are from Mongar, Lhuentse, Bumthang or Trongsa. English is the language that we need to engage with the World – and engagement with the world, at the political level as well as through participation in a globalised economy and travels, is necessary to enhance and sustain our very sovereignty. The call for protection and promotion of Dzongkha, therefore, should not be equated to cosmetic jingoism or ultra-nationalism but as a genuine concern to retain an important element of national unity, identity and stability. For, Dzongkha is more than a language. It is our national language – one of the binding forces that will ultimately define our destiny as a nation. 1.1.2019 – Nothing has changed in me as far as New Year Eve’s are concerned. For many years now, I have stopped making any big deal about. No remorse of the year that goes by and no resolutions for the year that sets in. New year Eve? It is just another night. Every night I go to bed being thankful for who I am and what the world gives me. Every morning I wake up to a new day of opportunity to something worthwhile or be of service to others. First, I felt sleepy and regretted a bar-hopping invitation from a friend (it’s more than a year since I totally quit drinking anyway). Second, and more important, for me no day is more important than another day. Any new day that I am alive and kicking is a new day and a new year for me. I welcome each day with a smile and a little prayer. I go to bed every night with the same little prayer and a wish – to see another day. Last semester on my return to Sherubtse from a foreign trip I resumed my lecture with, “Nice to be back with you. I had a helluva great time in Vietnam.” I paused and change my tone. “Actually, I have a great time wherever I am.” The class laughed. But I really meant what I was saying. Still, every New Year is a time to reflect on the year that went by and a time to look forward to what life has in store for us – and for those for whom we matter. But whatever has happened and whatever will happen, one thing is for sure – life will go on. So I have one wish for myself (you may wish the same if you want) – and that I would be able to go to bed every night, say my little prayer and sleep well – without any worry, without any remorse and with a smile on the face looking forward to another great day. Welcome to 2014, on that note.